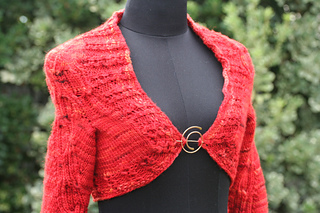 This cabled shrug has a unique twist, with spiraling cabled sleeves. 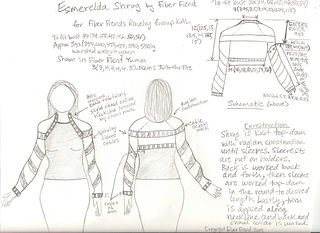 Esmerelda is worked top-down with raglan construction until the sleeves. The sleeve stitches are then put on holders while the back is worked back and forth. The sleeves are then worked top-down in the round until the desired length. 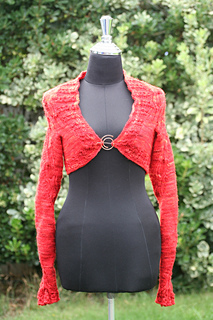 Lastly, the trim is applied around the edge of the shrug, creating a shawl collar around the neckline. Note: Esmerelda is made to fit tightly with minimal ease, although the sizing runs a bit small (especially in the sleeves), so if between sizes you should probably go with the larger size. 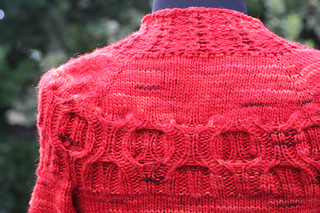 Check out the Fiber Fiends group to chat with others knitting this pattern.